City officials and business partners met this morning at Annwood Park in East Walnut Hills to officially kick-off the largest RecycleBank program in the Midwest. City officials say that the incentive program is geared to encourage community members to recycle by measuring and recording the amount of material they recycle, then translate that participation into points that are redeemable at local and national retailers, much like a frequent flier program. As an added bonus, Cincinnati-based Procter & Gamble has partnered with RecycleBank in rewarding residents for their green actions as part of their new Future Friendly initiative. This means that community members who register for the new RecycleBank program will receive a $5-off reward toward the purchase of any Future Friendly product from the P&G eStore while supplies last. At today’s ceremony, Office of Environmental Quality director Larry Falkin shared the excitement felt by many in the crowd. Another component of the city’s new recycling program includes new 96-gallon recycling bins that can hold u pto five normal-sized bins worth of recyclables. City officials say that this will allow them to cut back on recycling pick-ups to once every two weeks, thus saving the city money. The new larger carts also allow the city to implement the new RecycleBank program and automate lifting operations of the bins. “If possible, residents should separate their trash bins from the new recycling bins,” said a Rumpke worker who explained that keeping the bins out from underneath power lines and trees will allow the truck’s robotic arm to work with ease. The enhanced recycling program is being rolled out in four phases, with rewards and pick-up beginning this week in some neighborhoods. 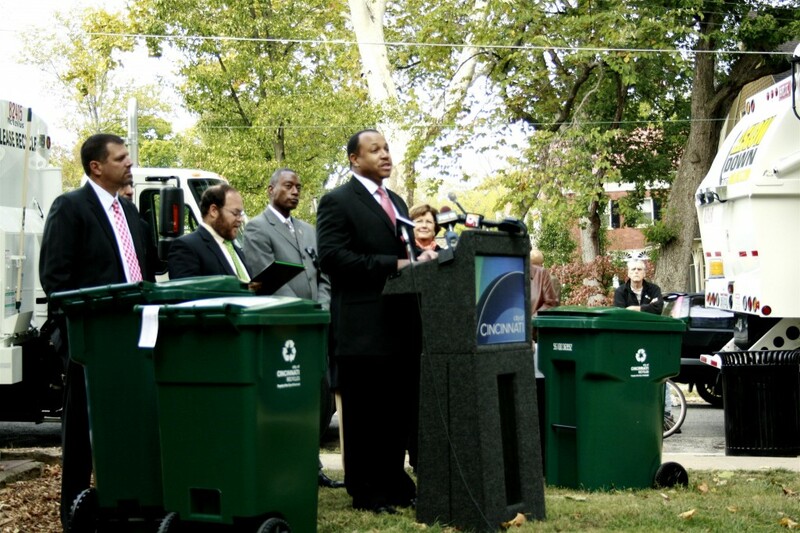 The roll out will continue through February 2011, and any Cincinnati resident who lives in a single- or multi-family home with existing curbside trash pickup is eligible to take advantage of this new program. Those interested in taking advantage of the new RecycleBank rewards program are required to register online or by calling 1-866-563-0114.